Another step forward for 'portablism'? "DJs everywhere are going to love this," says Numark. Portable turntables with built-in speakers are nothing new (heck, we had them when we were kids), but Numark reckons that it's about to release the first one ever to feature an adjustable scratch switch. 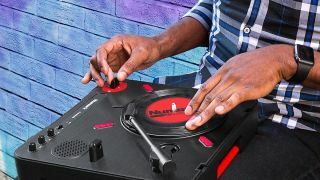 The PT01 Scratch enables you to add custom scratch effects anywhere you like (the turntable can be battery powered) using either your left or right hand. The deck also features a non-slip cartridge system so that, in theory, the stylus will stay in contact with your records' grooves regardless of playing angle or vibration. "We know that DJs want to take their music outside and not be restricted to where they practice their art. That's why our portable turntable business is exploding," said Chris Roman, Sr Product Manager for Numark. "The PT01 Scratch takes the portable turntable to the next level, by being the only one to provide a real scratch switch. DJs everywhere are going to love this."